At Cefalà Diana, a small village of 992 inhabitants, situated on a hill in the interior of the province of Palermo, Mary. appeared near the ruins of a castle, May 26, 1967, four boys as "Mother of Sorrows" and in tears. At Cefalà Diana, a small village of 992 inhabitants, situated on a hill in the interior of the province of Palermo, Mary. appeared near the ruins of a castle, ,four boys as "Mother of Sorrows" and in tears. The boys were: Roberto Castelluci (11), Antonio Barbary (8), Francisco di Marto (12) and Antonio Bellavia (10). The same appearance was repeated later in front of many people, when children, courses in town to announce the big event, led them to the place of the apparition. As a result of this phenomenon, a church was was built and consecrated June 22, 1969 by Cardinal Francesco Carpino, Archbishop of Palermo and dedicated to the Virgin of Sorrows. The church, the destination of many pilgrimages, is reached via a path big but not very large, surrounded by trees. 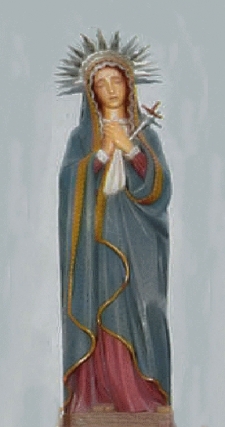 Mary appeared as "Mother of Sorrows" and in tears. As a result of this phenomenon, was built from 1967 a church was consecrated on June 22, 1969 by Cardinal Francesco Carpino, Archbishop of Palermo and dedicated to the Virgin of Sorrows. The church, the destination of many pilgrimages, is reached via a path big but not very large, surrounded by trees. Until now the apparition has been recognized only for worship.